Christmas is right around the corner and I'm so excited to announce my Christmas Mini-Sessions. 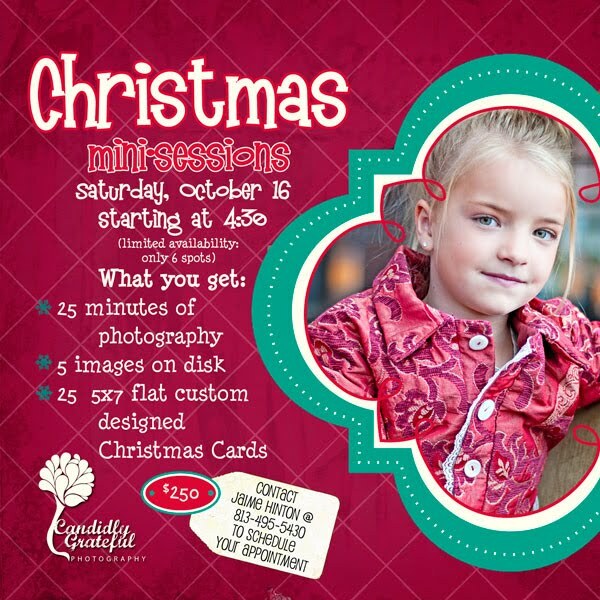 This is a great way to get some awesome pics of your kids or family and get your Chrstmas cards taken care of at the same time! And not just old boring christmas cards, but I will personally design a custom Christmas card for you using the awesome pics we take on this day. And because this is for Christmas, and I love blessing people on Christmas, I want to offer a discount. The first 3 people to book a session will get $100 off! That's right it's the deal of the year so hurry and book your session today by e-mailing me at Jaime@candidlygrateful.com or calling me at 813-495-5430. See the flyer below for more details.